As we wind down our coverage of cinematic Conan clones, we figured we’d have to get in at least one “Never Got Made” piece. Conan may have fought many tough battles and wicked foes, but nothing could prepare him for the harshest realm of existence – Hollywood development hell. Sure, it seems like sequelizing a huge breakout hit would be a no-brainer (emphasis on the “no brains” part), but this is Hollywood we’re talking about here. So buckle your seatbelts for the up-and-down rollercoaster that is the attempts to get another Conan flick with star Arnold Schwarzengger made. Early in the production process of the first film, producer Edward Pressman did a smart thing and signed Schwarzenegger for 5 Conan movies. 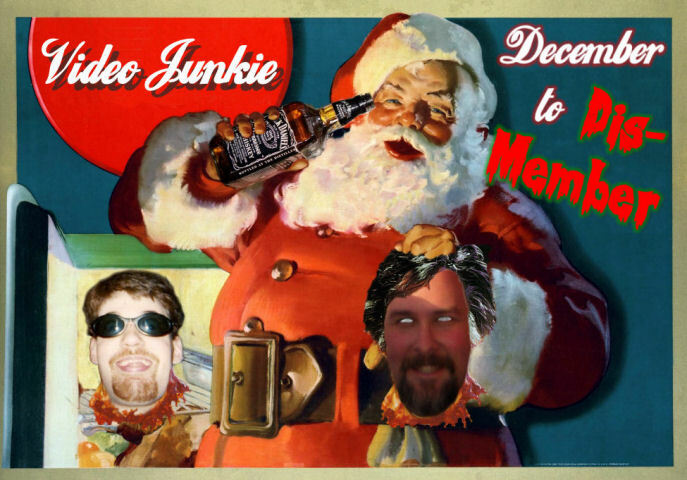 Makes sense given the plethora of material. Discussing the upcoming sequel CONAN THE DESTROYER (at the time titled CONAN, KING OF THIEVES) to Starlog in 1983, Schwarzenegger seemed optimistic about the future films and said he loved playing the role. As the world knows, always trust an Austrian. Unfortunately, you could see the cracks beginning to surface. 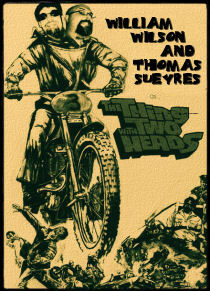 He bemoaned the idea of Milius not being around and the concept of a PG Conan flick. Most importantly, he started the interview by saying, “Every decision is based on money.” (You can also see that sentiment in the pic above.) When CONAN THE DESTROYER came out in June 1984, it did fairly well at the box office. However, it did less than the original which probably sent the suits into a tizzy because they “worked hard” to neuter the Barbarian for a PG rating to get the kids in the theater. The film’s tameness, coupled with some really forced comedy, resulted in a film that lived up to its name with – as we like to joke here at VJ – it truly destroyed the series. Regardless, producer Raffaella De Laurentiis saw enough gold that a third film was immediately planned for a 1987 release. 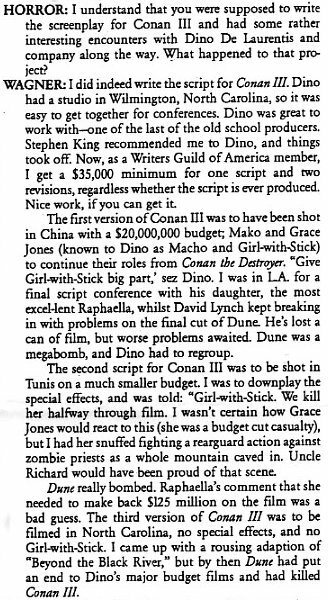 Around the time DESTROYER was coming out, William Stout dropped this tiny blurb to Cinefantastique that he was writing the CONAN III script. 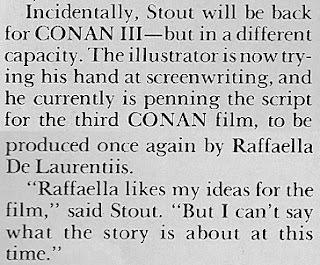 This actually sounded like a step in the right direction as Stout worked on both the earlier films as a designer/artist and seemed well versed in the Conan universe. 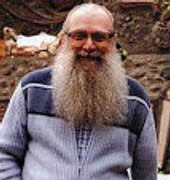 In addition, he had previously co-written the Conan clone THE WARRIOR AND THE SORCERESS. 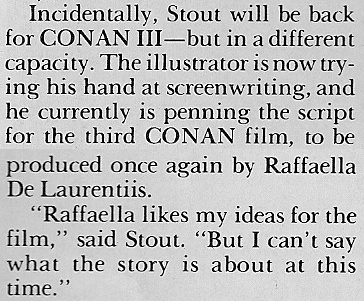 Little is known about Stout’s proposed screenplay except that it was titled CONAN AND THE EYE OF DEATH. Sounds awesome! Around the same time, producers signed on fantasy writer Karl Edward Wagner to do up a sequel script. Again, this seemed like a great fit as Wagner was well known and respected for his work in the fantasy field. 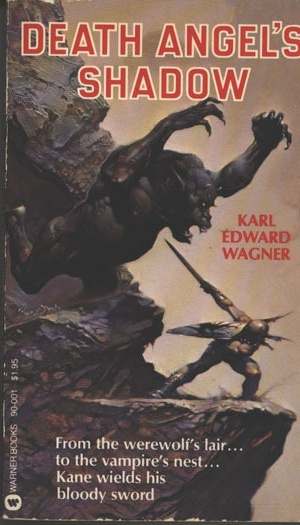 He had edited several collections of Robert E. Howard’s Conan works in the late 70s and created the popular Conan-esque character Kane in a series of books from 1970-85. Most importantly, he had written the well received Conan sequel novel The Road of Kings in 1979. Here Wagner outlines his involvement in the CONAN III script process to Horror magazine. Interestingly, it seems producer Dino De Laurentiis was initially looking to shoot in China and wanted a direct sequel to DESTROYER as the characters played by Mako and Grace Jones were to come back. But, as you can see below, the project just kept getting smaller and smaller. Definitely not a good sign. Two directors considered for the project at the time were Bond vet Guy Hamilton and John Guillerman. The public, however, seemed to be tiring of the genre as evidenced by the disasterous box office of RED SONJA (1985), which co-starred Schwarzenegger. The action hero himself wasn’t suffering though as Schwarzenegger suddenly became an even bigger star with the release of the comedy TWINS (1988) – his first film to crack $100 million domestically – and, as the man said, “every decision is based on money” and poor ol’ Dino didn’t have much at the time thanks to expensive flops like DUNE (1984). "What I loved was the idea of a man who had become king by his own wit and prowess, but once enthroned got lost in protocol and politics, and forgot those characteristics. Once dethroned, he had to go back and remember the person he'd lost. Victory always costs something. I felt that Arnold had grown enough as an actor to play that complexity." Unfortunately, the theme of Schwarzenegger using his clout carried over into the 1990s as he just had the biggest film of his career come out (TERMINATOR 2) and was dragging his feet on the project. Ironically, he passed on CONAN III to make THE LAST ACTION HERO (1993), the most expensive flop of his career. The De Laurentiis family had a trick up their sleeve though as they reworked Pogue’s script to fit around Kull of Atlantis, another Howard creation, and gave the world KULL THE CONQUEROR (1997). But they didn’t learn their lesson from DESTROYER as they again went for less violence and more comedy. The film bombed upon release in August 1997. 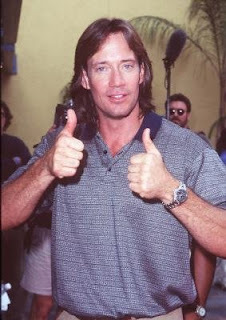 I hear Kevin Sorbo still apologizes at conventions for it. 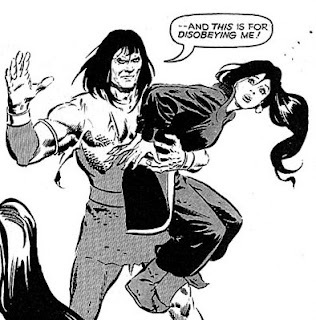 The CONAN III project seemed as good as dead by the late 90s. Interestingly a rumor popped up in Starlog in 1998 that Schwarzenegger himself was interested in directing the third film. 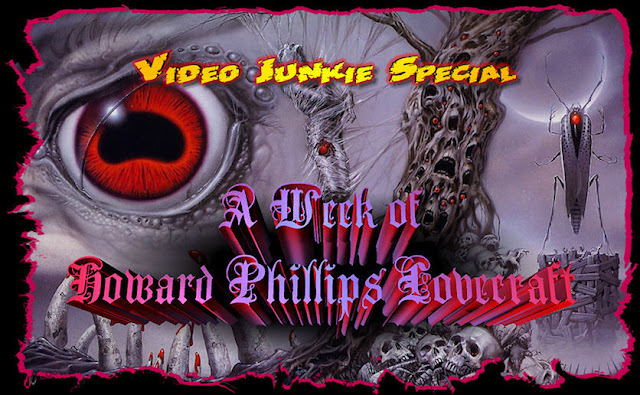 Here is a tiny blurb about it from The Arnold Fans in April 1998.